What is the role of transabdominal ultrasound in management of patients with IBD? A systematic review of 33 studies of imaging modalities (ultrasound [US], computed tomography enterography [CTE], and magnetic resonance enterography [MRE]) attempted to identify the optimal modality for diagnosis, assessment of postoperative recurrence, and detection of complications in CD (Table 1). (1) Selecting the optimal modality must consider accuracy, safety and tolerability, and factors such as accessibility, availability, and cost. Accuracy is the overriding concern when imaging is a diagnostic procedure or when results are used to guide management. The most important safety considerations are radiation exposure, especially in patients diagnosed at a young age, and adverse events, such as those which may occur with intravenous contrast. Accessibility, availability, and local expertise also affect choice of modality, as delays in obtaining results can affect patient care and delay goal-directed therapy. Because clinical symptoms do not reliably reflect disease activity, the treat-to-target strategy requires routine objective monitoring to identify disease activity regardless of symptoms in patients with Crohn’s disease. (2) Objective disease monitoring is essential to implementing appropriate therapeutic alterations to achieve mucosal healing and improve outcomes. This directive, however, is not so simple to implement in clinical practice. (2) The gold standard for objective monitoring, ileocolonoscopy, is not feasible for frequent routine monitoring, as this invasive assessment has associated risks and limits in patient acceptance. Computed tomography (CT) carries concerns about repeatability and cumulative radiation exposure, especially in younger patients. Magnetic resonance imaging (MRI) is an expensive modality with limited access, excluding its routine use. When applied in clinic during routine follow-up of patients with established Crohn’s disease, there is significant potential to influence clinical decisions, both to adjust or direct therapy and to guide further investigations (8). Because of these advantages, US can be considered a first-choice imaging modality both for routine surveillance and for evaluation of exacerbations in patients with CD. (2) It will be important to generate data on monitoring with US as part of the treat-to-target strategy. 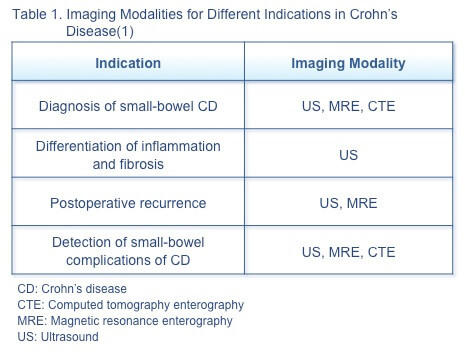 Greenup AJ, Bressler B, Rosenfeld G. Medical imaging in small bowel Crohn’s disease-computer tomography enterography, magnetic resonance enterography, and ultrasound: “Which one is the best for what?” Inflamm Bowel Dis. 2016;22:1246–61. Horje CSHT, Bruijnen R, Roovers L, et al. Contrast enhanced abdominal ultrasound in the assessment of ileal inflammation in Crohn’s disease: a comparison with MR enterography. PLoS One. 2015;10(8):e0136105. Castiglione F, de Sio I, Cozzolino A et al. Bowel wall thickness at abdominal ultrasound and the one-year risk of surgery in patients with Crohn’s disease. Am J Gastroenterol. 2004;99:1977-83. Novak K, Tanyingoh D, Petersen F et al. Clinic-based point of care transabdominal ultrasound for monitoring Crohn’s disease: impact on clinical decision making. J Crohns Colitis. 2015:795-801. What is the importance of the treat-to-target strategy in pediatric patients with IBD? What does treat to target really mean in IBD? How is shared decision-making evolving in IBD practice?